Almost imperceptibly at first, then more and more, you begin to feel sad, empty, or irritable. Gradually, things that used to fascinate you are no longer interesting. Hobbies, favorite recreations, and spending time with the ones you love are no longer pleasurable and may even seem burdensome. The day becomes dominated by feelings of lethargy, being tired, run down, or overwhelmed by life. Your movements and mental processes may seem to move in slow motion, thoughts crawling like molasses. Concentration can be difficult. Problems that used to be solved quickly are no longer as easily thought through. You may spend hours worried about whether life will ever return to normal. You may have problems going to sleep at night or with waking up too early the next morning. You might even seem to sleep all the time. 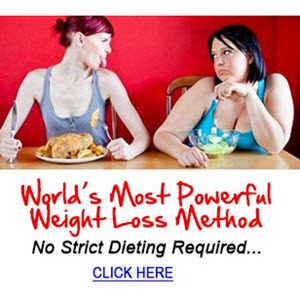 You might gain weight or be so caught up in brooding that you forget to eat. You might feel worthless or guilty far in excess of what the circumstances should warrant. These symptoms are all associated with major depression, an Axis I disorder. In contrast, there are people for whom "depressiveness" is more than a symptom. Although they do indeed feel sad and guilty, their emotional state emerges as an expectable consequence of an entire matrix of pervasive, long-standing characteristics. Always in a dejected and gloomy mood, they see themselves as inadequate and worthless. They submerge themselves in criticism for even minor shortcomings and tend to blame themselves when things go wrong. A pervasive pessimism leads them to anticipate the worst—to expect that life will always go wrong and never improve. Their days are spent brooding and worrying, ignoring the good and dwelling on the bad. Saturated with guilt, they wish that life could be different, but instead of taking the initiative, they berate themselves for missed opportunities and feel powerless to change their destiny. Such individuals may indeed be depressed, but their depression emerges from a way of thinking, feeling, and perceiving—a depressive personality. Consider Evan, our next case study (see Case 15.3). Evan is making an attempt at therapy, but he's not the most optimistic person in the world. In fact, Evan doesn't know why he bothers anymore. His comment about five previous attempts is a way of setting expectations for his current effort, evidence of a pessimism that colors his whole outlook (see criterion 6). In one voice, he accuses his past therapists of not caring, but then he turns it around on himself by saying, "If I were someone else, I wouldn't like me either." Anyone else would recognize that the odds of getting five therapists in a row who didn't "care" are vanishingly small. Evan, however, first exaggerates the negative, then follows up with a globalized attribution in a one-two punch against the self (see criterion 3). Instead of focusing realistically on what is good and bad about himself, he seems to assert that he is all bad and, implicitly, that he will never be liked and no one will care about him. Later, he states that he knows his life is not right, and it is his fault. Not surprisingly, Evan has no enthusiasm for work, and it shows. Pessimism and an inadequate, worthless self-image are only two of what for Evan are a matrix of personality problems. At night, he broods instead of sleeps, recycling his problems repeatedly in his mind (see criterion 4). His usual mood is determined by the words he uses to convey his outlook on life (see criterion 1). Things are "depressing,"
"I don't know why I bother," Evan says. "I've tried therapy five times before, but it never works out. Nothing ever works outs. I wasn't getting any better and the therapists don't really care. I don't really blame them, I guess. If I were someone else, I wouldn't like me either. "1 He called at the suggestion of a coworker at the video store, where he works part-time. His manager complains that he works slowly and shows no enthusiasm for customer relations. "Even the other guys are starting to avoid me," he says. Evan seems focused on some inner wound. He is overweight and his skin looks pasty. He looks tired and complains of hours each night spent brooding instead of sleeping. His speaks slowly and uses words such as depressing, futile, and hopeless. The overall impression he creates is that this could well be the last time he may be able to muster up some hope for change. Evan has almost no social support. He acknowledges a few acquaintances at the store where he works, but says that they cannot really be considered friends. When asked why this is, he maintains that he is fundamentally different from other people. For others, the world is an adventure, he states, but for him it is threatening, lonely, and disappointing. He believes others are frightened away because "they can sense, even smell, that I am not right, that I've fallen so far short of what could have been." His words are forced out with great guilt. "I know it is my fault if my life is not right, but I just can't seem to do anything about it, I'm a worthless human being. I'm at my best when I'm zoned out in front of the TV," he continues. "That way, I can distract myself from the misery of who I am." In addition to his job at the video store, Evan has been taking classes at the local community college off and on for the past 10 years. Nevertheless, he is still six credits short of an associate's degree. His C- average is attributed to difficulty concentrating, which makes reading a chore. "A single chapter seems like an eternity," he says. Worse, Evan states, "I have fallen so far short of what I wanted to do and be in life." He states again, "I can never make up for that lost time, I can never repair the damage, and the clock just keeps ticking. Sometimes, it's all I can think about." Evan is the youngest of four children. All his siblings are older by at least nine years. "We don't have anything in common," he laments. "They're from a different generation, they don't understand me. I don't think they'd even miss me. They were a complete family before I got here, and they'll be a complete family if I was gone. That will never change." His father is a pilot for a major airline who never bonded with his son. His mother had a successful real estate career, "but she says she had to give that up for me." He is currently "disconnected" from his family, although they all live in the area. "They were not the family I was supposed to have," he observes. "I tried to keep in touch. When I first became depressed, things got a little better, but everyone seems to avoid me now." B. Does not occur exclusively during Major Depressive Episodes and is not better accounted for by Dysthymic Disorder. "futile," and "hopeless." Worse, Evan has almost no social support; he has acquaintances but no friends. For others, "the world is an adventure," but for Evan, it is "threatening, lonely, and disappointing." People are frightened away, he states, because "they can sense, even smell, that I am not right, that I've fallen so far short of what I could have been." More likely, Evan closes himself off because he feels guilty about not living up to expectations and becomes excessively self-conscious about his perceived shortcomings when he is around others. Because his presentation is accompanied by excessive guilt (see criterion 7), he may also feel too pathetic to deserve friends and feel that his loneliness and hopelessness are a just fate. Given the portrait of Evan, we now approach additional issues that form the plan of this section. First, we compare normality and abnormality; then we move on to clinical variations on the basic depressive personality. Next, the section "Evolutionary Neu-rodevelopmental Perspective" shows how the existence of the personality disorder follows from the laws of evolution. Also included are a comparison between the depressive and other personality constructs and a discussion of how depressive personalities tend to develop Axis I disorders. Characteristics of a normal-range depressive personality style can be developed by creating less extreme parallels to the diagnostic criteria described in the DSM-IV. Whereas the usual mood of the depressive personality disorder is typically gloomy or dejected (see criterion 1), the personality style is more reflective of the negative aspects of self and situation but is not so overcome by them that joy becomes an impossibility. Whereas the disordered individual has a self-image of incompetence, worthlessness, or inadequacy (see criterion 2), individuals with the style are simply more self-conscious of their standing relative to similar others but are able to take constructive initiative when necessary. Whereas the disordered is overly self-critical (see criterion 3), the style is aware of both positive and negative aspects of the self but tends to focus on the negative. Whereas the disordered broods and worries (see criterion 4), the style takes time to think things through from a realistic perspective. Whereas the disordered is sometimes overly critical and negativistic toward others (see criterion 5), those with the style are perturbed by those who need to exaggerate the good at the expense of what is realistic or tend to neglect to consider the effects of their behavior on others. Whereas the disordered is pessimistic (see criterion 6), the style is realistic, giving the negative its due. Whereas the disordered is excessively guilty and remorseful (see criterion 7), those with the style have a low threshold for apologizing for their conduct but are not obsessed by perceived shortcomings or failings. Evan falls more toward the pathological end. Not every depressive personality is like Evan. The depressive often exhibits features of other personality disorders. The resulting moods and actions that these individuals manifest give a different coloration to the basic depressive pattern that makes them similar to, yet different from, cases like Evan. Such subtypes of the depressive personality are summarized in Figure 15.3. Actual cases may or may not fall into one of these combinations. As a combination of the depressive and negativistic personalities, the ill-humored subtype presents with grumbling discontent, endless complaints, and chronic irritability. Fears of bodily disease and illness are common. Such individuals act out their conflicts and ambivalent feelings, displaying bitterness and resentment alternating with periods of self-accusation and guilt. They find contentment in nothing and vacillate between tormenting themselves and turning their negativism against others, demanding that their complaints be heard. When others react by insisting that they give up their moody despair, the ill-humored are likely to become more forthright in oppressing others with their own bad feeling. For limited periods of time, they may become agitated, wring their hands, and pace about. In some cases, they exhibit hostile depressive complaints, bemoaning their sorry state and demanding attention to their manifold physical illnesses, pains, and incapacities. As Kretschmer (1925) has described them, they appear cold and selfish, irritable, and critical; they rejoice in the failures of others; and they never wish others the rewards and achievements of life. As a mix of the depressive and histrionic or narcissistic patterns, the voguish depressive sees suffering as something noble. Both Schneider (1923/1950) and Kraepelin (1921) found that certain depressives display vanity and voguishness. This subtype asserts that only those gifted with special sensitivities have the capacity to feel with such depth and self-consciousness. By making pain the subject of contemplation, they find a philosophical refuge that affords them a status other depressives lack. Some display an aesthetic preoccupation, a way of dressing and living that gives stature to their unhappy moods. Using fashionable language and reading avant-garde authors, they create a perception of acute suffering and awareness that draws attention and evokes admiration from others. Popular modes of disenchantment are adopted as a means of attracting the interest of a certain fringe element for whom alienation from the mainstream is always the recurrent theme. If Evan were to develop a fascination with existentialism and wax philosophically about the futility of life, he would take on characteristics of this subtype. 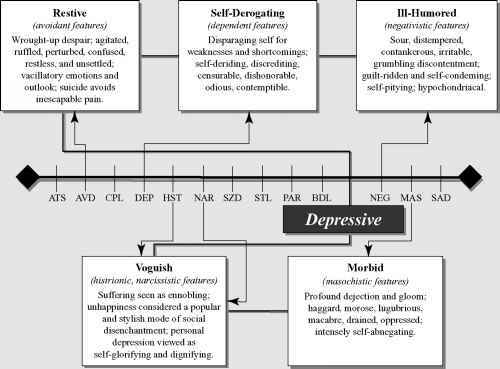 The self-derogating variant of the depressive personality resembles the depressive-masochistic character (Kernberg, 1988). Such individuals exhibit extraordinary guilt that lurks just below the surface, together with a need to discharge this guilt through various forms of self-punishment. When conflicts with others arise, they anticipate abandonment, leading them to admit weaknesses and condemn themselves to deflect further criticism and secure help and support. Actual loss of an instrumental surrogate or significant attachment figure almost invariably prompts severe dejection. Feelings of resentment and hostility, which might provoke actual abandonment, are turned inward and thereby transformed into expressions of self-criticism or reacted against as verbalizations of remorse. Such maneuvers decrease the individual's sense of self-worth, but at least temper the anger of others and prompt them to react in ways that make the subject feel worthy and loved. Hostile feelings and resentments are thus disguised because acts of self-derogation shift to others the responsibility to respond and induce guilt in others. As a combination of the masochistic and dependent patterns, the morbid depressive exhibits a deep depressive paralysis that frequently blends into an Axis I clinical depression. Morbid depressives exhibit deep feelings of gloom and profound dejection. They slump down, turn their gaze away from others, and hold their heads like a heavy millstone. They may lose weight and look haggard and drained or awaken several hours too early, their mind filled with oppressive thoughts and a growing dread of the new day. A vague dread of impending doom, an utter helplessness, a pervasive sense of guilt, and resignation to their hopeless fate are common. Such reports are a by-product of the belief that they are incapable of coping with their problems, a consequence of their dependent features. When not lost in deep gloom, morbid depressives engage in a withering self-contempt, demeaning everything about themselves and seeing only the worst of what they have done in life. Plagued with a relentless and obsessive pessimism, they assert that things will always get worse and never get better. They are outcasts, doomed to suffer forever as victims of fate and their own helplessness. Evan, our video clerk, has many of these qualities. As a mix of the depressive and avoidant personalities, restive depressives exhibit anguish and agitation. Thoughts about the problems others have caused them produce a perturbed discontent that rarely shows itself in overt behavior. Instead, restive depressives restrain their irritability by turning it inward, manifesting despondency and disaffection with themselves. They are nervous, fretful, and distracted, and their emotional life consists of a sequence of brittle moods, usually short-lived and intense. Unable to get a firm hold on their feelings, they may commit self-destructive acts, expressed either directly through violent suicide or indirectly through severe alcohol or drug abuse. Despairing that anything in life will ever be rewarding, they feel obligated to do something to express a deeply pessimistic view of both life and themselves. Feeling defeated and helpless, seeing no way to restore their participation in the good life, many of these restive types conclude that they must rid themselves of the inescapable suffering of their painful existence. Suicide becomes the final act that demonstrates that they can indeed control their lives. Depressive Personality or Dysthymia? Are Dysthymia and Depressive Personality Synonymous? In the DSM-IV the depressive personality is not classified with the other Axis II disorders, but instead is listed in the appendix as a disorder requiring further research. The depressive is controversial, in part, because its proper location in the multiaxial system is uncertain. Some suggest that it should be considered a characterological variant of depression. Here, pessimism and a temperamental disposition to negative affective states would create a vulnerability to depression as a mood disorder. Others argue that the depressive personality is redundant—that it merely reflects the influence of a background depression so long-standing and pervasive that its symptoms have become crystallized as trait-like features. The usual objections involve the perceived overlap between depressive personality and dysthymia and the clinical utility of the new construct (Sherman, 1995). The results of the Mood Disorders Field Trials (M. Keller, Hanks, & Klein, 1996) go a long way in clarifying this controversy. Although there was substantial overlap between subjects diagnosed as dysthymic and those diagnosed as having a depressive personality, many dysthymics did not meet criteria for depressive personality. Thus, the overlap was not complete. In fact, the proportion of those with depressive personality disorder who had never met criteria for dysthymia was high (Shea & Hirschfeld, 1996), providing strong support that the depressive personality describes a domain of functioning that cannot be accounted for by dysthymia alone. Furthermore, a personality dimension described as negative affectivity (Tellegen, 1985; D. Watson & Tellegen, 1985) captures many of the experiences of those diagnosed as depressive personalities. Also called neuroticism, negative affectivity refers to a persistent proneness to negative experiences, namely moodiness, nervousness, stress, a low threshold for becoming annoyed or irritated, excessive worry, and difficulty concentrating. High scores on this dimension contribute negatively to subjective well-being (DeNeve & Cooper, 1998). Taken together, the Field Trials, along with research using measures of negative affectivity and neuroticism, point to a crucial taxonomic distinction: The disposition to experience negative emotional states must be separated from the emotional states themselves. The first is an Axis II disorder; the second belongs to Axis I. From a biological perspective, it is likely that there are genetic factors and inherited neurotransmitter profiles that play a role in the development and maintenance of the depressive personality although more research needs to be done before we understand the complex ways in which these interact with life experiences. The psychodynamic perspective offers the notion that there is an impoverishment of ego that leads to melancholia. These individuals represent themselves as worthless, incapable of achievement, and deserving to be cast out and punished. Object relations theorists emphasize the themes of self-criticism and vulnerability to object loss for the depressive. Bowlby's well-known attachment literature (e.g., Bowlby, 1969) has also shed significant light on how the depressive develops. The interpersonal perspective argues that they correctly perceive that they are being rejected by others but do not recognize how their behavior causes others to withdraw. Depressives' interpersonal style leads to and perpetuates their feelings of being inadequate and unworthy. Cognitively, depressives are pessimistic across every domain of their lives. Beck et al. (1990) propose that hopelessness and helplessness lie at the heart of the depressive personality and color not only the perceiving of new stimuli but also the retrieval of the memories. In the evolutionary model (Millon, 1990; Millon & Davis, 1996), the depressive personality is referred to as the passive-pain pattern. Characteristics include glumness, pessimism, an inability to experience pleasure, and psychomotor retardation. In conjunction with a history of significant losses, there is a sense of having given up, of accepting despair, of resigning himself or herself to an anguished destiny fraught with misery and self-criticism, one in which personal fulfillment is no longer possible. The inclination to experience a troubled life with depressive symptomatology is not necessarily maladaptive in all of its aspects. Such inclinations signify an ability to communicate helplessness and dependency that elicits nurturing attention and care. Hence, the disposition to become depressed may have been selectively reinforced to serve an important function in the course of evolution. Problematic in certain regards, this temperamental disposition may have enhanced the likelihood that those who deeply suffer the slings and arrows of life will likely elicit protective care to a greater extent than those who are incapable of expressing such feelings. In sum, depressiveness may not only stem from a fusion of biogenic and psychogenic sources but also reflect qualities that increase individual survival. Contemporary studies suggest that genetic and neurochemical factors play a distinct though modest role in various depressive personality subtypes. Work in population and family studies, specifically those focused on twins and adoptees, suggest several biological markers of a depressogenic inclination. However, evidence gathered in numerous family studies indicates that there is considerable heterogeneity among depressive disorders, be they exhibited in a clinical syndrome or a personality disorder. This work suggests that there are numerous heterogeneous subtypes that may not differ genotypi-cally; on the other hand, there may be genotypically distinct types that do not differ phenotypically. It appears that depressive affect may be grounded at a very early stage in development. It is at this time that the child acquires experiences, through parental feeling and behavior, that its environment is receptive and caring or indifferent and distant. The child learns at this time to discriminate experiences of a pleasurable character from those more painful in nature. Fundamental feelings of security and attachment result from an adequate level of sensory gratification and nurturance. However, a failure to experience clear and unequivocal signs of warmth and acceptance at the sensory level may create fundamental feelings of insecurity, emotional detachment, and isolation. A distinction should be made between the experiences of the depressively prone and the avoidantly prone child. In the depressive, we see parental distancing or indifference; in the avoidant, we see rejection and devaluation. The depressive infant lacks experiences of warmth and closeness; the avoidant does experience parental interaction, but it is of a deprecating and belittling nature. The depressive child learns to give up, since its efforts to bring forth the deficient warmth are unsuccessful. The origins of depressive withdrawal are found not only in extraordinary circumstances such as those associated with total parental disengagement or death but also in lesser form among infants who lack important experiences of warmth and parental responsiveness. This may be seen in the less problematic parent-child relationships reported in the work of Bowlby (1969) and Mahler et al. (1975). Both recount circumstances in which the child is unable to experience the affection and consistent support of a significant maternal-like person. Bowlby's work describes studies of children and lower animals faced with troublesome separations from parental-like figures. Following initial protests and efforts to search for and retrieve the lost objects, the child gives up and withdraws into what Bowlby describes as despair and disorganization. Withdrawn and inactive, such children learn to make few demands on their environment, become emotionally detached rather than attached, conserve their energies, develop a generalized sense of hopelessness and, because of their limited capacities and immaturity, feelings of helplessness. Given the preceding as a base, youngsters who are prone to depression approach adolescence with serious doubts concerning their potential appeal as a member of their gender. Anticipating disinterest or derogation from their peers, these youngsters cannot retreat to their homes seeking acceptance and understanding. Devaluing themselves and expecting to be further devalued by all segments of their social world, they turn inward to minister and pamper themselves, disinclined to venture forth to be further alienated and derided in peer-group relationships. Their lack of confidence in themselves and in what they will elicit interpersonally further reinforces the belief that they are unattractive persons who will be further humiliated by others. Depressively prone youngsters not only allow themselves little pleasure but also are self-punitive and self-sadistic. Increasingly distressing though it may be to look into themselves, they continue to find the reality of self to be despicable and condemnable. Wherever they go, the despised self is inherent, an ever-present and condemned existence. The result of such introspection disrupts their cohesion and uncovers a fragile psychic state that produces a chronic series of depressogenic feelings, experiences, and relationships. Unlike the avoidant, who desperately seeks to avoid painful feelings of shame and humiliation, depressives passively accept what they view as no longer avoidable. As with the masochistic personality, depressives seem to desire suffering, perhaps more suffering than their history, circumstances, or actual personal failures would warrant. They exaggerate their misery, magnify imperfections, and accuse themselves in order to deepen and wallow in their own misery, all while eliciting the sympathy of others. Gradually, life dwindles into nothingness. A comparison and contrast with similar personality constructs follows. Table 15.3 presents a review of the total depressive pattern. Appearance and posture convey an irre-lievably forlorn, somber, heavyhearted, woebegone, if not grief-stricken quality; irremediably dispirited and discouraged, portraying a sense of permanent hopelessness and wretchedness. Judges self of no account, valueless to self or others, inadequate and unsuccessful in all aspirations; barren, sterile, impotent; sees self as inconsequential and reproachable, if not contemptible, a person who should be criticized and derogated, as well as feel guilty for possessing no praiseworthy traits or achievements. Because of feeling vulnerable, assailable, and unshielded, will beseech others to be nurturant and protective; fearing abandonment and desertion, will not only act in an endangered manner, but seek, if not demand, assurances of affection, steadfastness, and devotion. Internalized representations of the past appear jettisoned, as if life's early experiences have been depleted or devitalized, either drained of their richness and joyful elements or withdrawn from memory, leaving him or her to feel abandoned, bereft, and discarded, cast off, and deserted. Possesses defeatist and fatalistic attitudes about almost all matters; sees things in their blackest form and invariably expects the worst; feeling weighed down, discouraged, and bleak, gives the gloomiest interpretation of current events, despairing as well that things will never improve in the future. The scaffold for morphologic structures is markedly weakened, with coping methods enervated and defensive strategies impoverished, emptied and devoid of their vigor and focus, resulting in a diminished, if not exhausted, capacity to initiate action and regulate affect, impulse, and conflict. Engages in acts of self-denial, self-punishment, and self-tormenting, believing that he or she should exhibit penance and be deprived of life's bounties; there is not only a repudiation of pleasures, but also harsh self-judgments as well as self-destructive acts. Is typically woeful, gloomy, tearful, joyless, and morose; characteristically worrisome and brooding; low spirits and dysphoric state rarely remit. Note: Shaded domains are the most salient for this personality. The depressive shares major traits with several other patterns. The schizoid, avoidant, and depressive personalities seem socially withdrawn and unable to find pleasure in life. Schizoids, however, lack a basic capacity to experience emotions of any kind with any intensity. Accordingly, they appear withdrawn because they lack affectionate feelings necessary for social bonding. In contrast, depressives feel deeply anguished. Obviously unhappy, depressives nevertheless understand the concept of happiness, whereas the schizoid cannot. Moreover, though depressives may withdraw from the social world, they are socially attached, meaning that certain relationships are valuable, have been valuable, or could be valuable to them. Both avoidants and depressives often feel a sense of shame, fixate on their failures, and sometimes close themselves off from the world. Avoidants, however, desperately want to join socially but take the perspective of others in viewing themselves as intrinsically defective. In contrast, depressives just give up and accept their pathetic state as inevitable and irreversible. They withdraw because they lack the energy for social interactions or because they want to be alone in their misery. The depressive also shares traits with the masochistic, negativistic, and borderline personalities. The depressive and masochistic are so similar that some authors view them as a single constellation, the depressive-masochistic character (Kernberg, 1988). Both share an obvious discontent. Nevertheless, depressives are best distinguished by their hopelessness and social withdrawal, whereas masochists, though evidently unhappy, participate in their social surrounds and create situations of setback or failure that compound their own misery. Both the depressive and negativistic share an abiding pessimism, a feeling of personal misfortune, and a sense of being misunderstood and devalued, but for different reasons. Negativists feel that others overcontrol, depersonalize, and take advantage of them. Their pessimism and discontent are a direct reaction to the feeling that authority is improperly vested. In contrast, the pessimism and discontent of the depressive are far more broadly generalized. Moreover, the negativist fights back passive-aggressively, whereas the defeated depressive has no fight left. The borderline personality is frequently dysphoric and depressed and, therefore, appears on the surface similar to the depressive personality. However, borderlines are intensely labile; their emotions may suddenly shift from love to hatred, for example. In contrast, the depressive is steadily and passively gloomy. As always, it is important to remember that there is a logic that connects the personality pattern with its associated Axis I syndromes. Depression and dysthymia should be the most common comorbid Axis I syndromes for the depressive personality. As noted previously, individuals with more depressive personality features should be more disposed to the development of major depressive episodes. Logically, the depressive personality is nothing if not a disposition toward being depressed. Because depression has numerous vegetative aspects, some individuals should exhibit a variety of vague somatic complaints, evidence of a preoccupation with bodily symptoms. Depressives who are especially prone to brooding may also show evidence of an anxiety disorder. The interpersonal perspective argues that symptoms should subside somewhat at the formation of new relationships and then increase as rejection mounts. As this occurs, self-esteem should decrease and feelings of worthlessness increase. Is regressing and vacillating in depression bad? What is meant to have a depressive personality? Is there such a thing as a depressive personality?